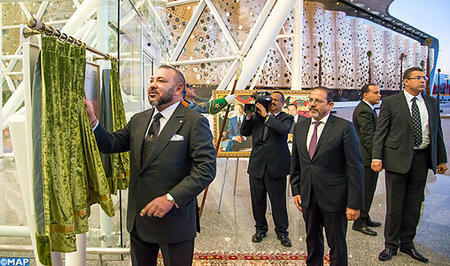 HM King Mohammed VI inaugurated, on Wednesday, the new terminal of the Marrakesh-Menara airport, an additional asset to enhance the city’s attractiveness and boast its most innovative technologies. This large-scale project, worth 1.22 billion dirhams, is an implementation of the royal instructions seeking to offer the city of Marrakesh a modern airport infrastructure meeting international standards to manage the growing passenger traffic, support the city’s social, economic and tourist development and foster its status on the international scene. It is part of carrying out the development strategy for the national airports’ office (ONDA), which focuses on generalizing conformity with international standards in terms of the flow of international air traffic, air security, airport security and service quality. The extension of the Marrakesh-Menara airport involved the building of a new terminal over 57,000 square meters and the extension of the airplane park to house 12 additional medium-haul aircraft, which will bring the airport’s yearly accommodation capacity to 9 million passengers instead of a current 3 millions. To satisfy the needs of national and foreign users, the new terminal has high-tech equipment meeting international standards in terms of security and quality services and an architecture optimizing the fluid management of passengers. It includes a public hall, a boarding area, a duty-free shopping and dining area, and private lounges for VIP travelers. The new terminal also includes telescopic boarding and disembarkation bridges, an arrival hall, a luggage delivery area, exchange offices, and a car park offering 1,550 parking lots. The facility comprises also an exhibition area featuring currently two exhibitions on the COP22, a global event hosted by Marrakesh during the month of November. The terminal is environment-friendly and meets principles of sustainability as it includes innovative techniques to regulate the interior temperature of areas, limit the energy for lighting, and recover rainwater to water green spaces.